Sarah Hyland has been in hospital this week but it is not clear what was wrong. Sarah Hyland was hospitalised earlier this week. 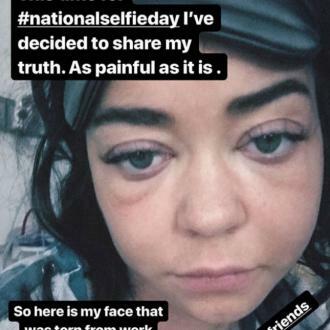 The 'Modern Family' actress was ''torn from work'' to receive medical treatment for an unknown condition and even though she didn't want to take a break from her job, she's ''very grateful'' to have been looked after because her health is a priority. She shared a candid photo of herself in a hospital gown on Thursday (21.06.18) and wrote: ''Sometimes a selfie is more than just a good angle or feelin cute. This time for #nationalselfieday I've decided to share my truth. As painful as it is. The 27-year-old star also shared a video of her dog licking her face, which had been filmed last weekend, shortly before she was taken to hospital. She wrote: ''This was taken this past Sunday. Day before hospitalization. She was literally telling me to get treatment. Though it is unclear why Sarah was hospitalised, sources told 'Entertainment Tonight' that she is now back home and doing better. Sarah - who was diagnosed with kidney dysplasia as a child and received a kidney transplant in 2012 - has spoken candidly about her health struggles in the past in in March she reached out to ask other sufferers of ''chronic pain'' to share their experiences. And last month, she revealed the side-effects from her medication are causing her to lose her hair. However the brunette beauty is unable to take over-the-counter hair loss supplements, such as Viviscal and Nutrafol, because they interact with her medication, so turned to her followers for natural remedies.